The first three months of this year have been busy with preparing BELMA, trying to recruit new members and setting up network meetings and the conference. Both Ranok (Ukraine) and Learnetic (Poland) are now members of the EEPG. There are talks to several other publishers who might join. As always, there will be a vote if this happens. The EEPG is now a member of the Educational Publishers Forum of the IPA (for a year to start with). Therefore, the meetings will be attended by the director and the minutes and the country reports are available for the EEPG. IPA is going to rework its position on Exceptions in Education to take into account FEP and European Group's positions. Georgia. Georgian Publishers and Booksellers Association is an IPA member, but this was their first participation in an EPF meeting. Mozaik. Ildikó Török will ascertain if Mozaik will become a member of EPF. BFU. As the IPA member, the Danish PA has no objection, BFU will be invited to become a new member. EEPG. Helga Holtkamp and José Borghino explained the new structure of the EEPG and the presence of current EPF member, Frank Thalhofer, as the new Chairman of the group. Publishers' relationship with government. Agreed to sharpen and formalize EPF statements and share on the website and in the Newsletter. The next EPF meeting is on April 13th in London. If there are specific issues you would like to be raised, you can always mail Helga Holtkamp until Wednesday morning and we will try to get it on the agenda. The EEPG was asked to become a partner in this project. The application was in HORIZON 2020 Marie Sklodowska Curie - Initial Training Networks. If the application is accepted, publishers, who are interested, will get an opportunity to work with teachers in the programme and have them as interns in their editorial departments (free of charge). The application was made in January, but no results have been received. When asked recently what the price of textbooks is compared to GNP in Europe, I could not answer that question. However, we established that in Europe, prices do not vary greatly, an average size language teaching book in France, Germany, Latvia, the Czech Republic or Israel might cost anything between 10 and 20 Euros. But in the US, the price of textbooks, especially in higher education, is much higher, driving the movement of open educational resources. The driving forces are, of course, the universities. Will this trend have a greater impact in Europe, not only in universities but also in schools? This question could well be a topic at our network meetings. You might also want to look at this interesting article from publishing perspectives. In Poland, educational publishing has suffered since the Ministry of Education's decision to subsidize school textbooks for all students. With the government making that change in 2014, many Polish educational publishers were forced into bankruptcy or had to look for new markets. Now the new Polish government that has been in power since November 2015 is planning more, different reforms. Read this interesting article by Jaroslaw Adamowski. Earlier this year, there were protests again against the educational system in Hungary. Teachers were joined by other unionized workers demanding a reduction in teaching hours and the freedom to choose textbooks. an amended budget was approved in April, taking into consideration the revised income structure from BELMA participation. The budget can be found in the members' section. A list of potential candidates from non member states was worked out and Helga is contacting them. If joining during the year, there will be a discount on the membership fee. If joining in 2017 but wanting to take part in the conference in September 2016, the fee for the conference will be the member fee. EEPG Network Meeting for decision makers. Cornelsen, Learnetic, Kreativni Centar, Sviesa, Otava, Veritas and of course, Systime. Unfortunately, as so often the case, Fraus and Gyldendal cannot take part because of conflicting events. A follow-up with a questionnaire will be sent to those who have registered on April 21st. As always, we appreciate active involvement. If you are not certain yet and need more information, please let me know and I will forward the follow up and questionnaire also. EEPG Network Meeting on copyright issues. Unfortunately, this meeting proves very difficult to organize. The Belgrade meting in 2015 was a great success and we are very keen to have a continuation. Unfortunately, all the possible keynote speakers have other time commitments. If a keynote speaker cannot be found at the "What works" conference in London next week, the meeting will have to be postponed. If you have any ideas for speakers, please get in touch. Here are the topics and a preliminary agenda. The keynote speakers can all be found on linked in. The moderator Markus Ritter is from the university of Bochum. What are the key factors for better learning? How can technology support teaching and learning? Summary overview of the situation in Europe, expenditure on education, enrolment figures, school equipment, etc. Please register directly on the website. The management board decided at the board meeting to design a set of bye laws for BELMA to be presented to EEPG members before the AGM in October with possible approval at the AGM. These bye-laws will describe both the process and the structure of the jury in detail. 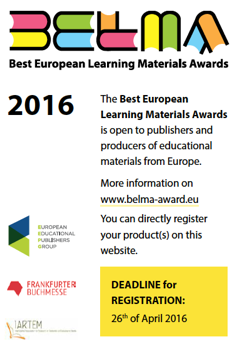 We aim to achieve transparency and ensure that BELMA remains a useful marketing tool for EEPG members. Meanwhile, the revision of criteria is making good progress. We did get a list of experts from some of you and these experts are now being contacted with a revised questionnaire. The first questionnaire was answered by 10 people (publishers, teachers, experts in didactics) and is now being revised following the feedback. If you can think of more people you would like to see represented in the second survey, please send a list. We have therefore agreed to devise a small questionnaire which will be sent to you with the next newsletter. However, if you have any more data that you can share please get in touch. I suppose most of you have come across the term "efficacy". In simple words it just means "the power to produce a desired result or effect". It is often used when talking about digital in the classroom. You might therefore be interested in this short article. You all know about Hattie, his studies and the impact they had. Here's an independent website for quick information about Hattie and visible learning. The early bird rate for this event has expired but maybe you are interested in the European Conference on Education conference in Brighton. And finally, I always find this website extremely useful. There is also a new Global Education Monitoring Report which we have put under useful documents on the website. And a document the Dutch Publishing association asked us to share.